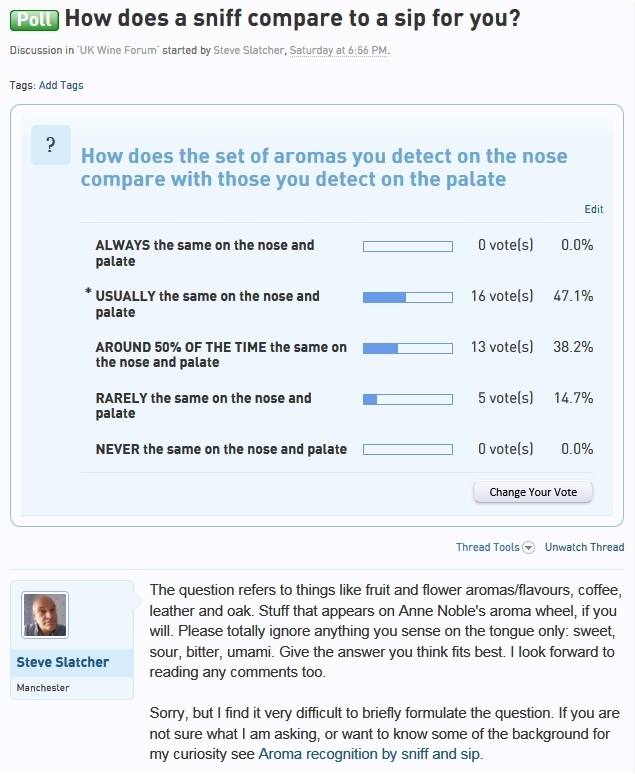 I have received no comments directly addressing the issue posed in my last blog post: whether aromas detected on the palate mirror those on the nose or not. However, I did get 34 wine-enthusiast responses to a poll on the UK Wine Forum. The results are not entirely clear cut, and my question could perhaps have been better, but it does seem that experiencing very different sets of aromas on the nose and palate tends to be the exception rather than the rule. I would thus very tentatively suggest that the results support the applicability to wine of the experiments regarding the number of aromas we can detect. However we need solid experimental evidence to be sure. It is quite possible that those who detect different aromas when the wine is on the palate are imagining the different aromas – in the sense that there are no chemicals present that could account for them, that is. But, neither can we rule out the possibility that those who detect the same aromas on the palate do so due to expectations created by the wine’s nose aromas. This entry was posted in Tasting and taste and tagged aroma, nose, palate, smell, tasting. Bookmark the permalink. 2 Responses to How does a sniff compare to a sip? Apologies for the lack of response Steve, I meant to comment because it was a post which struck a chord. Having tasted 400 wines over 4 days of Millésime Bio I was reflecting on how on one day red wines were more difficult to taste, due to atmospheric conditions, personal biology, biodynamic calendar who knows? Smell was easier and led the way even when wines were hard to taste. I do find smell and taste usually combine fairly equally but it was interesting when the nose led the way. Thank you, Alan, for that. When I next find it difficult to taste, I shall try to check if the nose is still good. Wonder if that also works with “palate fatigue” towards the end of heavy tasting days?